Summer is here, which means a lot of us will be packing our swim suits and sunscreen and traveling to exciting destinations here at home and abroad. 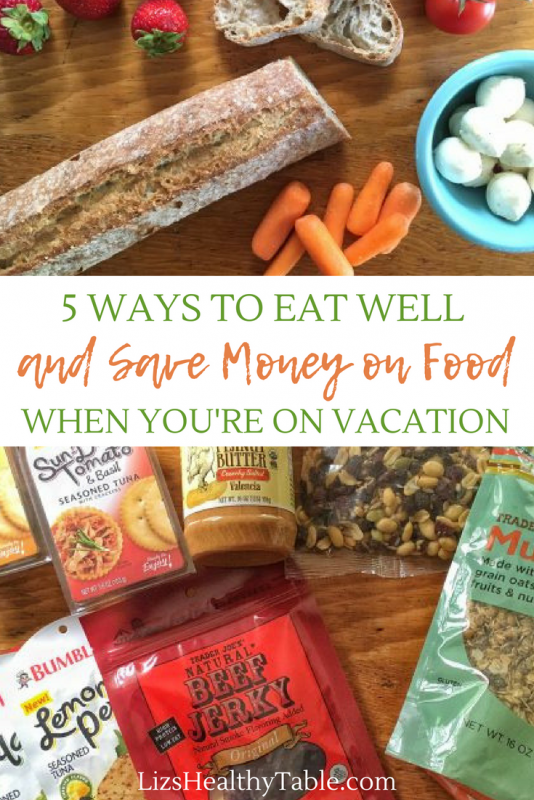 But plane rides, hotel rentals, and tickets to tourist attractions can add up quickly, especially when you add FOOD to the mix. Eating out three times a day can break your budget (and your healthy diet) before you’ve had time to digest dinner. 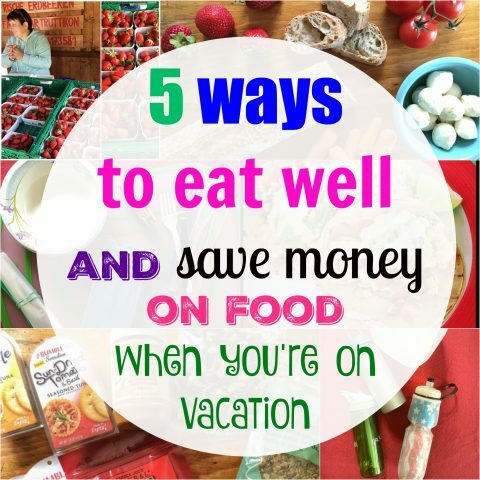 Check out my 5 tips for eating well and saving money on food when you’re on vacation. 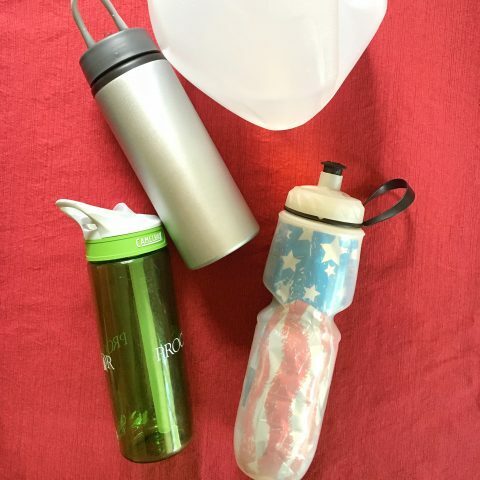 Quench Your Thirst for Pennies: I never leave home without my re-usable water bottle. From BPA-free plastic water bottles to the newer stainless steel insulated style bottles that keep liquids cold or hot for 24 hours, you can save big when you take control of your hydration. An empty water bottle is easy to pack in your suitcase, so go for it! When you get to your destination, fill your water bottle from the tap (most local water in the US is AOK to drink). But be sure to check ahead to find out if the local water is safe. If it’s not, buy gallon-size jugs of water when you get to your location, and re-fill your water bottle from that source. Added bonus: Using your own water bottle cuts back on the 200 billion plastic water bottles dumped into landfills globally each year. Pack Lightweight, Nutrient-Dense Foods: When you’re packing your swimsuit, don’t forget to also pack along some inexpensive yet healthy eats for the trip. 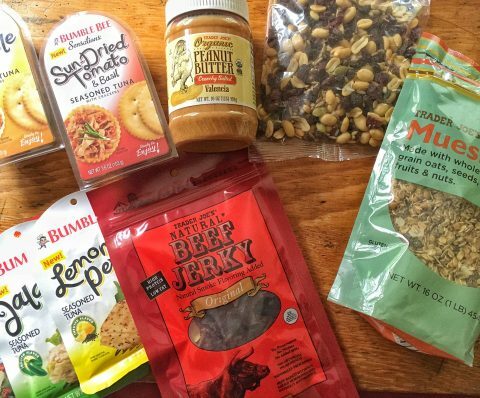 To save on between-meal snacks, shop at home before you leave for a few bags of fruit and nut trail mix, nut butters, all-natural jerky, or ready-to-eat tuna/cracker kits. Stick to packable protein foods since those are more likely to keep you feeling fuller and more satisfied between meals. 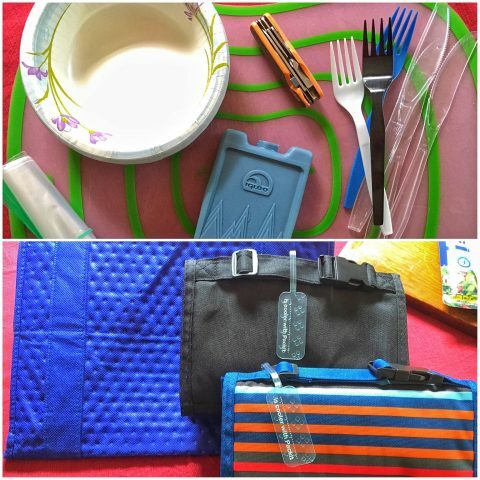 Pack Lightweight Utensils, Plates/Bowls, and a Cooler: Other things to pack along include disposable plastic or paper bowls (great for in-room breakfasts and picnics), plastic baggies, plastic utensils that you can reuse, a small ice pack or two, and a collapsible cooler. A pocket knife can come in handy too when slicing fruit and cheese, but be sure to pack it in your luggage … and NOT your carry on. Shop for Groceries Locally: Just because you’re traveling doesn’t mean you can’t go grocery shopping every day! 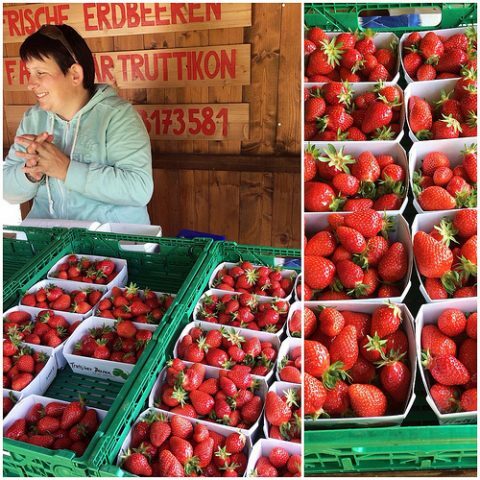 Part of the fun of travel is the locally-grown and produced food, so sightsee at local farmers’ markets, roadside fruit stands, and grocery stores. 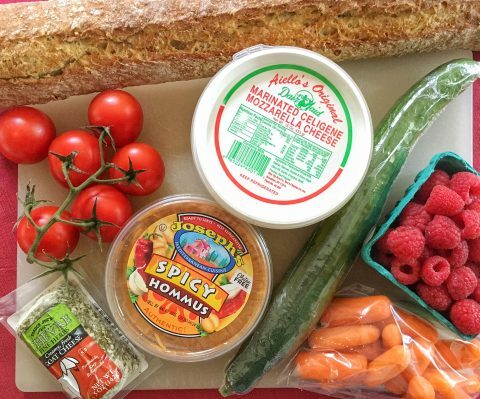 Shopping locally can yield easy picnic lunches and breakfasts. 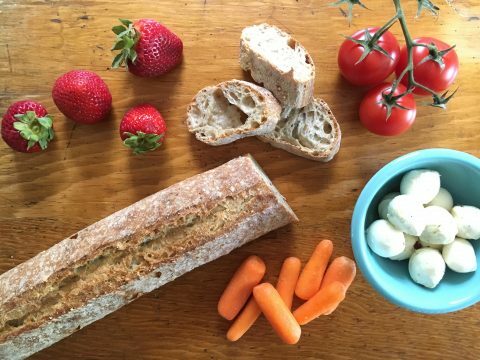 For lunch, grab a baguette, a wedge or two of local cheese, a few pieces of fruit (berries, peaches, or whatever else is in season), and perhaps a prepared salad or two. For breakfast, great things to keep on hand in your hotel room and fridge include nut butters and local jam, a loaf of hearty, whole grain bread, yogurt (save by buying the large tubs vs. individual tubs), a bag of granola or muesli, and fresh or dried fruit. As for coffee, always find out if your hotel offers complimentary coffee in your room or in the lobby. Eat out Strategically: When you’re traveling and eating dinner out every night, your wallet can quickly get skinnier! The best advice I have for eating out is to find restaurants that celebrate the local cuisine but aren’t too pricey or fancy. Ask the locals where they love to eat vs. asking the hotel staff. Touristy restaurants are often expensive and not as good as the local, hole-in-the-wall eateries. When you’re eating out, avoid the temptation to order an appetizer, entrée, and dessert. Instead, start by sharing a salad (it’s hard to eat your veggies when you’re on the road, so start the meal with a nice, veggie-filled salad). Ask your server about the size of the salad and then decide whether two or three of you will share it. Share an entrée too. Taking leftovers back to your hotel isn’t usually an option since you’ll have no way to reheat them the next day. U.S. restaurants tend to prepare giant portions of food, so you can definitely share an entrée when eating out in most places here at home. When traveling to Europe, the entrée will probably be smaller. Do a little snooping when you get to the restaurant to see what other folks are eating. 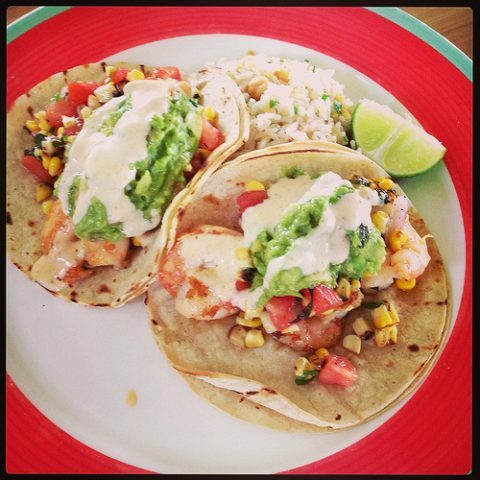 The shrimp tacos shown above is my favorite thing to order when I’m vacationing on Nantucket. They’re from a restaurant called, Millie’s, which features local seafood … and the prices are reasonable too! If you’re traveling to a developing country, do your homework first to make sure the food and water are safe to consume. You’ll have to adjust your plans accordingly . Check out my interview on saving money on food while on vacation on Boston’s NECN TV.